That engine looks like it was taken apart once before. Letter Stamps on the flywheel. T and D. Plus the way the lock-wiring was done on the cam follower retainer screws. Too bad about the barrels but that is typical when a rod lets go. The cam followers and the cam still look good. Swoosh how is the gear on the cam? Did it survive? 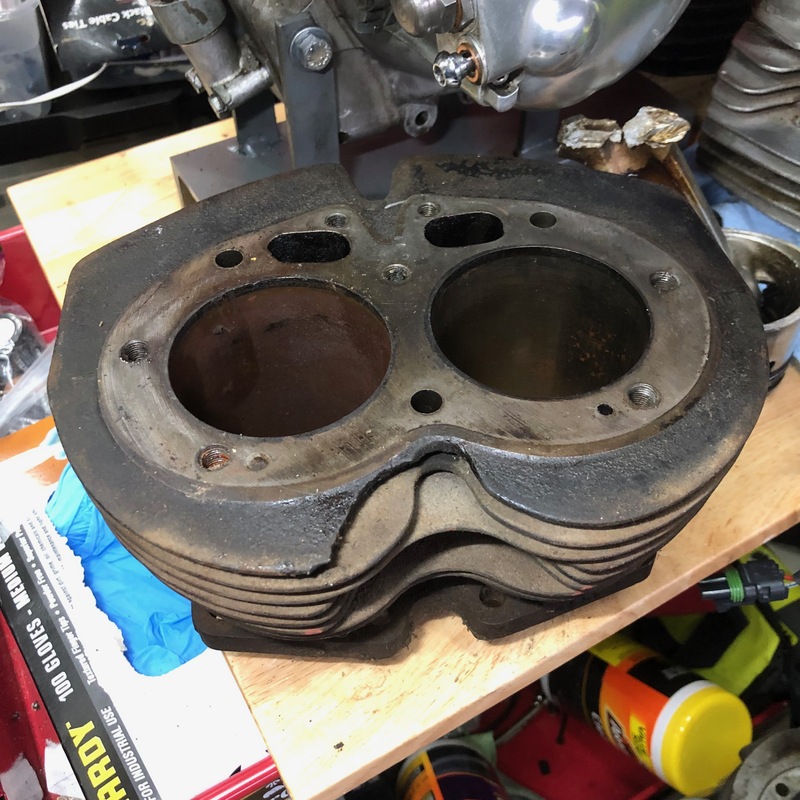 Dreer took it apart 30 years ago. Not for a full rebuild, just to make sure everything was ok. Not a ton of miles in the meantime. Not sure what exactly he did or didn't do. That was a long time ago. Gear on the cam? In the timing case? Don't know until I get in there. No rush. I have the spare motor to deal with first. Comstock says barrel is toast so I need to find an option there. Sorry I should have said worm gear for the tach drive. In the timing case on the end of the cam is a sprocket. It should be ok, more than likely the worse it had to do is chew on some aluminum. I suspect the steel big end exited the bottom of the engine pretty fast judging from the escape hatch it created. Oil pump o ring fell off on refitting timing cover after having a gander looking for rattle. Not a rattle, there was a gold looking film in the oil. Never will know what that was. my crank cleaned up fine, and wasn't bent, neither was the camshaft. good luck with the repair, I hope you are as fortunate as I have been with the damage. How did you clean up the rest of the bike? Did you strip the oil system and clean it? I'm not worried about the crank. More about the barrel. Here's the barrel off the donor engine. I wouldn't be surprised if it was the original bore. One side is a little rusty but it looks better than I originally thought. Hopefully @comnoz can save it! Use your old cracked barrel to cut out a chunk of cast and pattern the broken section then weld it up before the bore work. Cut the base plate off of the cracked barrel and make a tool to support the 17mm rod aka Mick Hemmings tool for tightening and loosening the timing pinion nut and cam nut. You would have to watch the video. When you get served nothing but lemons, then make lemonade. And you know I won't be welding anything. Someone who is actually skilled at it will. While I wait to hear what I need to do with the barrel I got some goodies to cheer me up. 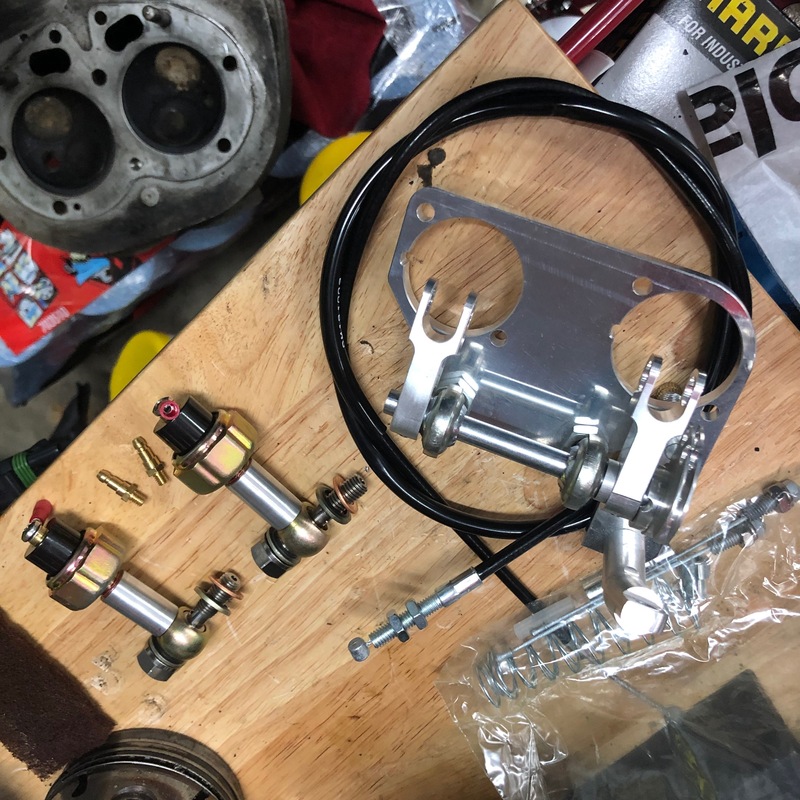 Two oil pressure sending units and the single cable carb kit from @madass140 Yes, it is as good as it looks. One of the oil senders is going to my brother... shhhh, don't tell him! gortnipper and Mike T like this. I watched a video on cracked cast iron parts repair. It involved drilling and threading a series of holes in the crack and putting in threaded inserts which were ground flush. Welding was not even considered for machined surfaces. Years ago when I worked for Hallmark Cards, I watched a similar repair on a Bobst embossing press that routinely cycled at 500 tons. Over time a crack developed from a casting hole in the rear main casting. It was still holding when I retired about 15 years later. Don's stuff is always nice. It will probably be cheaper to take one of my other barrels with a broken fin and have Jim fix it. I may look at the stitching in the future. The trick will be finding someone who knows how to stitch it correctly. Everything bar the oil tank (which will be cleaned out) will more than likely end up on my broken bits shelf. The barrel damage was limited, my machinist has advised that the bore will clean up with a hone, there is a small chip to the bottom of one of the sleeve's but I intend to round this out. @Adam_R What did you do about the oiling system? Did you get new hoses? Was there actually debris in the oil tank or did your filter catch it all?